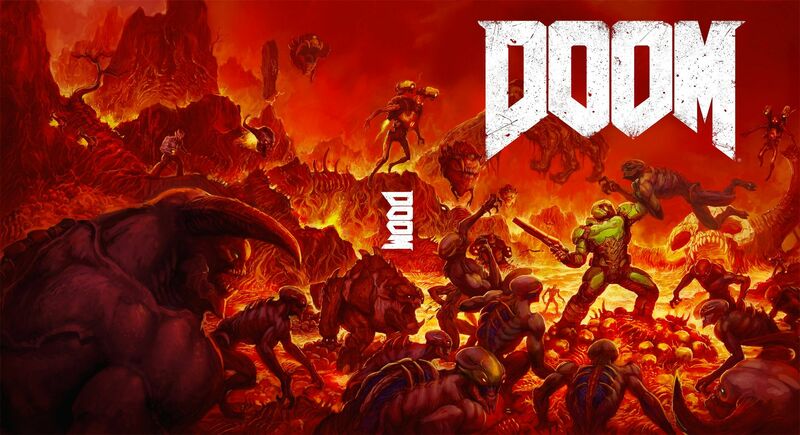 It really didn’t take long for me to figure out that id Software’s new Doom was something special. Perhaps this comes as a surprise to some, given the review embargos and awkward, anxiety laden lead up. Before the game was released gamers everywhere held their collective breath. There was a great fear that something had gone wrong in development; a gut feeling that had nothing to do with Hell’s minions breaking through a portal and far more to do with a recent trend in sequels. The multiplayer beta was received with mixed reviews and id Software’s tight-lipped attitude towards the game’s single player campaign did nothing to assuage the community’s mounting worries. There was a creeping sense of suspicion that yet another beloved franchise had succumbed to the great Machine of Commercialism: DOOM was going to be yet another casualty in a long line of pixel warriors turned into a cash cow and sellout. I thought the same. As the blue lights of my PS4 blinked and the game started up I held my breath along with the rest of them. Then I hit the title screen and Doom rolled across in its trademark Iron Maiden-esque font. Before I had a chance to think or criticize, the first level started and the heavy metal music rolled and I was the Doom Marine. In the opening moments of the game the developers released me from my Tomb, put a gun in my hand, and gave me enemies to slaughter. A computer monitor overhead blinked as it tried to fill me in on what was happening but before I could piece together anything coherent my character, in mild annoyance, tore the fucker off the wall. In that moment my anxiety left me and in its place was a bubbling excitement. It was time to go to war and Hell’s endless minions weren’t going to have any idea what hit them. 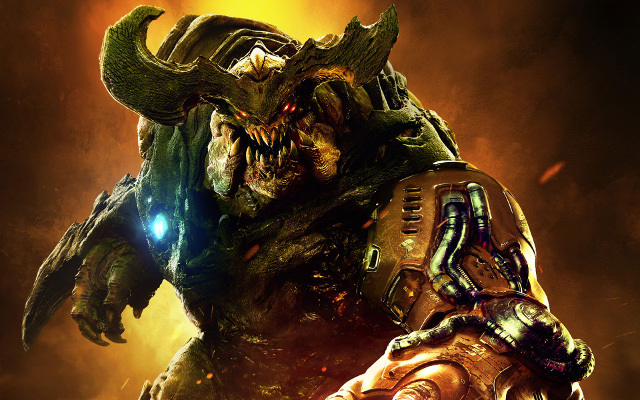 The Doom franchise is what people like to call a pure FPS. This means that every installment in the series, every bit of coding, soundtrack, and creativity, feeds into one singular goal: creating an endlessly entertaining cycle of violence. The original Dooms did this by utilizing fast-paced gameplay, difficult combat patterns, and a tantalizingly gruesome violence that swept players up and kept them invested. Doom 3 took a departure from this philosophy when it began to include various design mechanics and ideas more in line with survival horror. 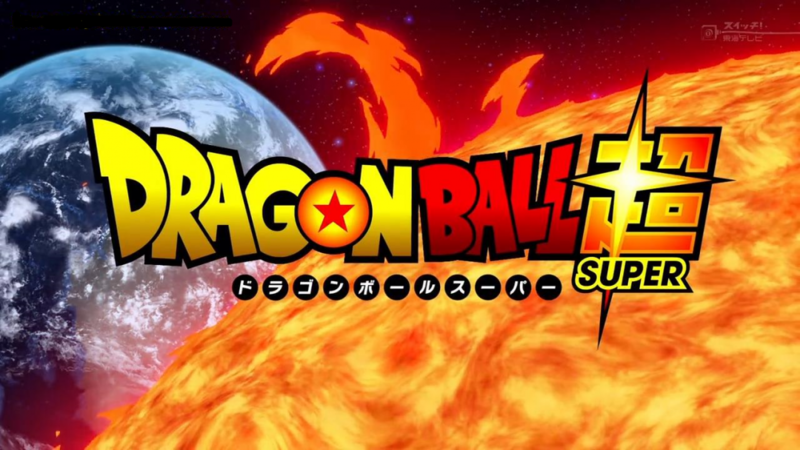 The gameplay slowed down and the enemies were paced to scare rather than overwhelm. 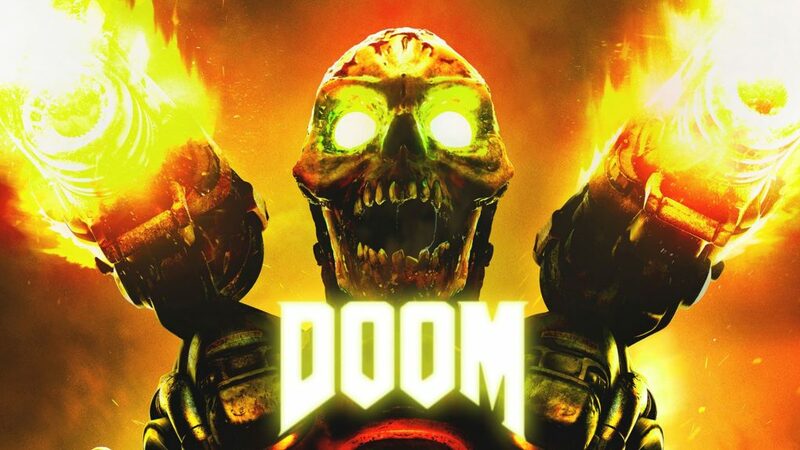 The core concept was still alive, the point was still to kill all demons, but for nearly a decade Doom seemed to have lost its trademark ferocity; lucky for us the developers seemed to have rediscovered it’s pure killer heritage. 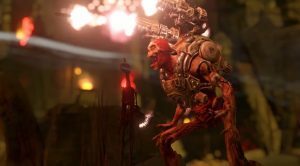 DOOM has gone back to its roots as a game designed around the thrill of straight up monster-mashing fun. That is made clear from the onset as The Doom Marine shows a distinct disdain for unnecessary prologue or down time. While the initial levels of the game follow a fairly standard learning curve, by stage three the training wheels are gone and off for good. Enemies begin to appear in greater numbers and complement each other in combat patterns and abilities. Imps are fast and throw hellfire that will chip away precious health while Barons and Mancubi present a serious life threat that needs to be dealt with quickly. A fact only emphasized by a health system that relies on HP and Armor drops forgoing the usual timed regen system. Combat scenarios like these are what fuel the DOOM addiction. It is like playing chess with guns, where every fight is a puzzle that needs to be handled with the correct approach and hot lead combination. There is no right or wrong answer in how you kill your enemies but there are ingeniously designed traps and enemy pairs that put your strategy to the test. Good thing killing demons doesn’t really ever lose its mass appeal, especially when their deaths are strung along by heavy guitar riffs and bass drops that only accentuate the already fast paced game. The heavy metal soundtrack gives a much-needed life to the mindless slaughter and it isn’t the only thing id Software has cooked up to keep the player interested. In addition to enemies that will make you bleed, DOOM has an armory capable of making even the best FPS blush in embarrassment. All of the fan favorites have come back from the BFG to a lightning gun that turns enemies to ash. And the best part is, there is no guns paradigm that makes you choose or pick your babies. The Doom Marine can carry everything and for that we have to thank the gods of slaughter. That isn’t all; Doom also introduces a new way of interacting with these weapons in a system that offers branching upgrade paths and abilities. The regular shotgun for instance doesn’t stay mundane for long; less than an hour in the game you are offered a choice to either upgrade it to multi-shot burst or make its rounds explosive. Beyond these two initial upgrade paths there are more than a few additional unlocks that will make the gun’s abilities more consistent, accurate, or devastating. How the Doom Marine chooses to customize his arsenal is up to you but I can say one thing, depending what you choose, the combat changes dramatically. What makes this new Doom so interesting is that despite the normal complaints of its genre, the often repetitive combat loops, enemies, and guns, it manages to circle strafe most of that by emphasizing something often overlooked, personal play style. Doom wants you to be creative with how you kill. The game actively encourages you to think about what feels best to you, what is the most fun, and it gives you the opportunity to tweak the Doom Marine closer to that image. That is the game’s driving force and philosophy, to do everything in its power to make you look good and allow you to choose how you do it. Part of achieving that is customizable weapons but another part is customizable kills. Another new mechanic to DOOM is Glory Kills, brutal and devastating finishers that the game allows you to perform on staggered enemies either with your bare hands or your chainsaw. You can tear a demon’s arm off and beat his skull in or throw him on the floor and stomp out his heart. Not only are these animations just as brutal and epic as they sound they are mechanically useful for more than just the violence. Killing monsters in this manner nets you much needed ammo and guaranteed health. This makes the timing of these moves a strategic matter that often requires a bit of forethought and concern. Tie Glory Kills together with upgradeable guns and you have an endless cycle of close calls, strategic victories, and defeats that challenge your brain as much as your reflexes, a welcome change to DOOM. Long gone is DOOM’s reputation for being brain-dead gore and guts, there is a depth now that demands attention. 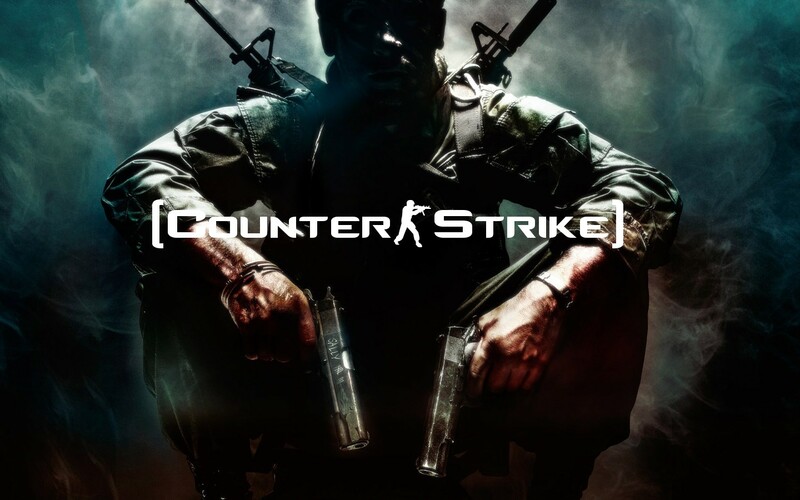 While the marketing may have most convinced that the game is nothing but violence, the added mechanics and sound design say something different. They signal a distinct change, a unified vision of what a pure FPS game like DOOM can accomplish on the new generation of consoles and PC. 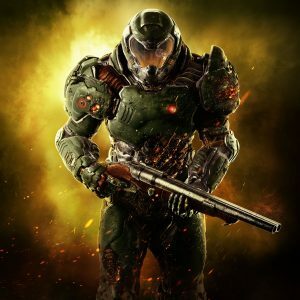 With this game id Software has not only succeeded in building its first commercially relevant Doom in over a decade but it has proved that the aging franchise now has a foothold in the new modern world. 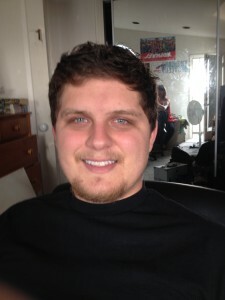 NitWitty Score: The World is DOOMed! !